For a detailed description of each area and for more information please visit the website. Funding through this scheme is entirely to cover the purchase cost of equipment (incl. VAT) The equipment must be used for a project which addresses one or more of the RISE research challenges or specific themes (detailed above). For further information about this call please visit the website. If you wish to apply for either of these calls or would like to discuss them further then please get in touch with the Research Development team via our email. Categories: Funding Opportunities, Research Councils | Tags: Computer Science, Security, Technology | Permalink. After a bit of an absence, a few updates for colleagues with an interest in the Science with and For Society and/or Secure Societies calls, news of a new guide to improving gender equality in research organisations and a quick reminder of forthcoming Horizon 2020 calls. As ever, if anything catches your eye then we’d love to hear from you (euro_res@mmu.ac.uk)! Presentations and a video are now available from the recent SWAFS information day. The presentations covered the main topics for the 2017 call: Science Education; Public Engagement; Ethics and Research Integrity and Gender. The call will officially open on 12 April 2017 and deadline for applications will be 30 August 2017. Science Europe have made a number of presentations available from the launch of their new practical guide on ‘Improving Gender Equality in Research Organisations’. The guide, and the presentations, include thoughts on: avoiding unconscious bias in peer review; monitoring gender equality and improving grant management practices. Presentations are now available from the recent information day on the latest calls under Societal Challenge 7. Amongst the sub-topics covered were: cybersecurity; research to support critical infrastructure protection; border security and external security; fight against crime and terrorism; and pan-European networks of practitioners and other actors in the field of security. All calls are now open and have a deadline of 24 August 2017. With work well underway to define priorities for the last phase of Horizon 2020 (2018-20), there are still a number of opportunities open for the current 2017 call. 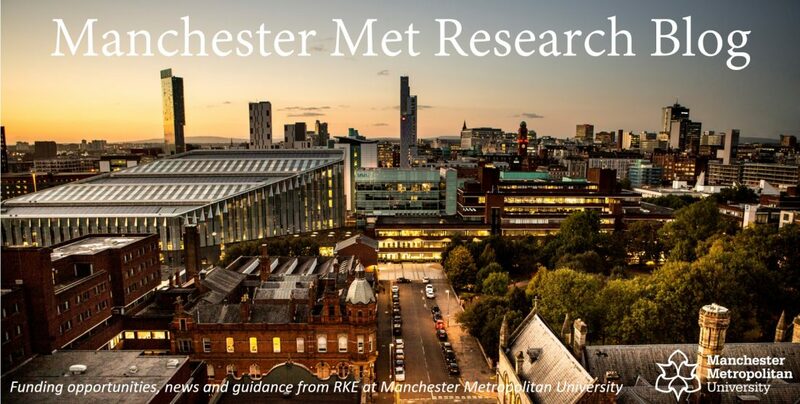 As ever, if you are thinking of applying, or want to know more, then please get in touch(euro_res@mmu.ac.uk). Categories: Horizon 2020 | Tags: European Commission, gender, Horizon 2020, Research, Science with and for Society, Security | Permalink. The Centre for Research and Evidence on Security Threats (CREST) is seeking to fund innovative and forward-looking economic, behavioural and social science research that will contribute to our understanding of contemporary security threats, or enhance the UK’s capacity to detect and mitigate such threats. Individual researchers and research teams in academic institutions, research organisations, SMEs, and industry are eligible for commissioning funds. Successful applicants will become part of CREST’s larger research programme, benefiting from resources for translating and communicating evidence for impact, and opportunities for sustained interaction with the user community. Applicants are invited to submit proposals for workshops, short projects and long projects by 31 January 2017. Categories: Funding Opportunities, Uncategorized | Tags: digital, Security, Social Science, Technology | Permalink. As discussions continue about priorities for 2018/20 and the next Framework programme there is still plenty to bid for in the 2017 call for proposals. To help you navigate what’s out there, the list below gives an overview of some of the main deadlines and links to help you access the relevant work programme. In each document you’ll see a range of topics and those with a ‘2017’ or ‘2016-17’ suffix (e.g MG-1.2-2017 or MG-1-5-2016-2017) are the ones to focus on. As ever, we’re keen to hear from you and support you with your submissions, so please do get in touch if you’re thinking of applying, need help deciding on a topic or just want to know more (euro_res@mmu.ac.uk). The earlier you get in touch, the more we can help! Categories: Horizon 2020 | Tags: Agriculture, Bioeconomy, Climate Action, Energy, Europe, European Union, Food security, future and emerging technologies, Health, Horizon 2020, ICT, Marie Skłodowska-Curie Actions, Marine, Research, Science with and for Society, Security, society, Space, transport | Permalink. The ESRC and AHRC will shortly be launching a further call for inter-disciplinary innovation awards under the Partnership for Conflict, Crime and Security Research (PaCCS) focusing on Conflict and International Development. This call is funded from the initial allocations the AHRC and ESRC under the Global Challenges Research Fund (GCRF) and a core focus will therefore be on conflict-related research which has the potential to contribute to the economic development and welfare of developing countries. In order to support innovation, the call will be open to applications which address any topic of relevance to the PaCCS conflict theme provided that they are focussed on conflict and human security in developing country contexts (at a community, national, regional or global scale) and its interconnections with issues of international development. Projects may be up to a maximum value of £100,000 fEC and up to 18 months in duration, commencing in November 2016. They expect to fund approximately 8-12 projects through this call. For more information, please visit AHRC. Categories: Funding Opportunities, Researchers | Tags: AHRC, conflict, crime, ESRC, Security | Permalink. FET Open and FET Proactive info day – the Research Executive Agency and DG Connect will be hosting an info day in Brussels on 25 January 2016 covering the forthcoming calls for FET Open and ‘Emerging themes and Communities’ (FET Proactive). Details of the day and registration can be found here. For those of you who can’t make it in person, the event will be streamed and presentations available after the event. Spreading Excellence and Widening Participation – the Commission will hold an information day on this area of Horizon 2020 in Brussels on 2 February 2016. Places will be awarded on a first come first served basis, via email: RTD-INFO-DAYS-B5@ec.europa.eu, and registration will close on 11 January 2016. Secure Societies Info Day – an info day is being organised by SEREN3 (the network of National Contact Points for Societal Challenge 7). Likely dates are 16 or 17 March 2016, and further details will be available in the New Year. As ever if you’re planning to attend please let us know (euro_res@mmu.ac.uk)! Categories: Events, Horizon 2020, Uncategorized | Tags: Europe, European Commission, FET, Horizon 2020, Research, Security, Spreading Excellence, Widening Participation | Permalink.